The best guilty grilled cheese sandwich is made from ingredients some might consider embarrassing. The basics are bread, butter or margarine, and sliced cheese. 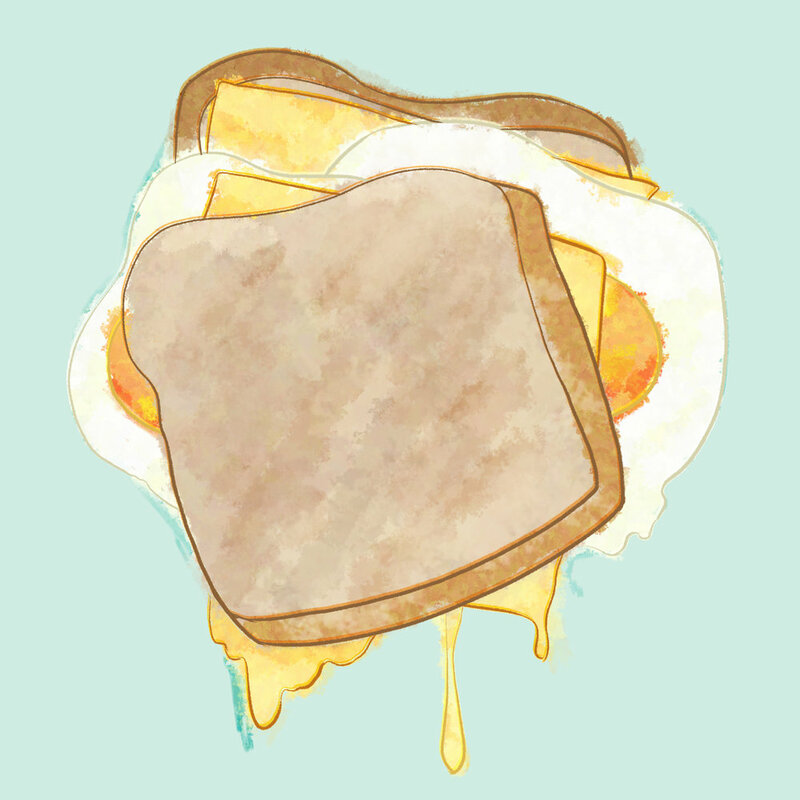 The key ingredient for the best guilty grilled cheese is a fried egg. For cheese, you want 2-3 slices of American. Pre-wrapped singles will work, but come on, that's so wasteful. As for bread, soft wheat is a good choice, but sourdough will give you a bit of an extra bite to it and also allow for a larger sandwich if you're a hungry monster. Get a big egg. Like, and extra large egg. Just use the biggest eggy boy you can get. Two eggs if ya nasty. Prep your sandwiches by stacking the bread and placing a slice of cheese on one. Set this next to the stove. Heat a sandwich-sized frying pan to just under medium heat. Melt a generous chunk of butter as it's warming up so as not to burn it. When it's hot enough to make a drop of water spit, crack that egg(s) in there and cook over easy so to get as runny a yolk possible. Remember the bread we set aside? It's time to shine is now. Plop that egg onto that cheese on bread and season with salt and pepper. If you went for the gold and made two eggs, separate them with a slice of cheese between the two and season both. Place your cheesy eggy bread slice in the pan, top the exposed egg with the final slice of cheese, and place the second bread slice on top. Notice I did not instruct you to butter the bread. You don't need that. Your pan is already greased with that egg butter. Come on. After waiting a minute or two, check the underside of the bread for it to be a golden brown. If it's good to go, flip that 'wich and fry up the other side until it is also golden brown. Finish this incredible monstrosity of a grilled cheese by plating and cutting it diagonally. You should have delicious gooey egg yolk ready to be eaten with your fancy guilty grilled cheese sandwich. If you wanna get extra fancy with it you can add some parsley or something, I dunno man, it's your sandwich. And there you have it. The tastiest dang grilled cheese this side of the county line. Should you decide to go with another sandwich at this time, you now have my recipe. Consider it a gift from me to you. Enjoy!